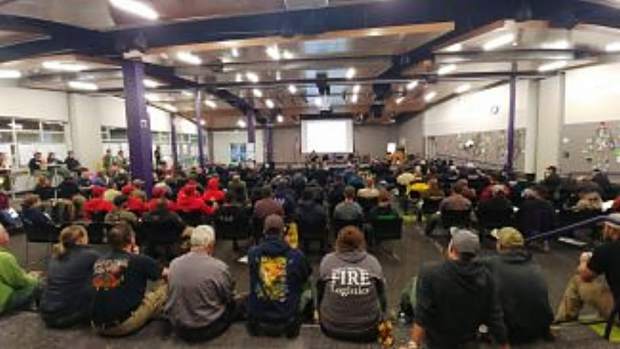 Regular community meetings to provide information and answer residents' questions were one of the successes of Eagle County's Lake Christine Fire response. The Eagle County Alert and Pitkin County Alert systems were both utilized at the Lake Christine Fire and were effective in communicating evacuation orders and other emergency information. But they worked most effectively for people who subscribed to both systems. To sign up for the Eagle County Alert system, visit www.ecalert.org. To sign up for the Pitkin County Alert system, visit www.pitkincounty.com. EAGLE — Clearly, local officials don’t want to experience another fire like the Lake Christine blaze that burned 12,566 acres, forced hundreds of evacuations and prompted a massive local and federal response. But if a fire of that scale does hit Eagle County again, then officials hope they have learned something from the experience this summer. This week representatives from several arms of county government gathered to debrief emergency operations coordination at Lake Christine. “Overall, it went well. That type of event was pretty scary for a lot of folks,” said White River National Forest supervisor Scott Fitzwilliams. In its after-fire analysis, Eagle County came to the same conclusion. “Emergency operations coordination staff showed great teamwork cooperation, dedication, problem solving and flexibility,” said Eagle County Deputy Director of Public Health and Environment Dana Erpelding. However, with that said, the county believes it can better position itself for future emergency scenarios. A list of more than 60 different action items — complete with an identification of the county department and individuals responsible — has been complied as the Lake Christine Wildfire Improvement Plan. The debriefing effort stressed the importance of emergency training and preparedness. For example, the report advised development of a comprehensive list of county facilities that can be used in the event of an emergency. Technology played a big role in communications at the Lake Christine fire. The Google maps of the fire area were particularly well received by the public. From the time the fire flared up July 4 through July 16, Erpelding said the Lake Christine fire Google map recorded more than 337,700 views. In the future, the county wants to refine standard operating procedures for the different communications tools and generally improve the way they are used. The Eagle County Alert and Pitkin County Alert systems were both utilized during the fire and were effective in communicating evacuation orders and other emergency information. But they worked most effectively for people who subscribed to both systems. “One of the areas for improvement is how do we get more people to subscribe,” Erpelding said. She noted that Spanish translation for all emergency notifications and public messages was one of the big successes during the fire. One of the future improvements will be to have staff assigned to provide translation and interpretation services. Facebook live streams were part of the information system at the Lake Christine fire and there were more than 80,000 views on the fire’s community meetings page. In the future, the county wants to assure that web content is mobile friendly and that other social media platforms are used to reach people who are not on Facebook. From shelter operations to use of the MIRA bus — a refitted RV that operates as a county services clearinghouse — to provide services, the county reached an estimated 1,765 people impacted by the fire. There was a massive volunteer response to the emergency and in the future, the county will designate a volunteer coordinator. Likewise, the county wants to improve the processes for accepting donations. The Lake Christine fire demonstrated the need for emergency animal shelter options, particularly for large animals such as horses. The Lake Christine fire also provided a lesson in unintended consequences. To ensure safety and control re-entry into previously evacuated neighborhoods, the county issued actual cards to residents to show they were authorized to be in restricted access areas. But the color of the card paper stock was green, leading to some confusion concerning what the county meant when it required a “green card” for re-entry. The county noted it was not referring to a permanent resident “Green Card” and it did not intend that connotation. Fitzwilliams noted that events such as the Lake Christine fire are logistical monsters. He said the best advice is for local governments to hand over the monster to federal incident commanders who have the training and experience to deal with them. “But there still needs to be a fair amount of coordination,” he said. That coordination continues long after the fire is out, Fitzwilliams added. Right now federal and county representatives are working out how to pay the fire bill. Fitzwilliams said the latest estimates figure Lake Christine costs at just over $17 million. Eagle County’s part of that bill will be in the $500,000 to $570,000 range, which will be allocated as in-kind services or paid from the emergency reserve fund. “Overall, considering the depth of this incident, everything went pretty well,” Fitzwilliams said. He noted that the federal officials were impressed by the local response from other governments, local agencies and the community itself. “Incident commanders don’t usually have parades and Neil Diamond dropping by to play for them,” he said.